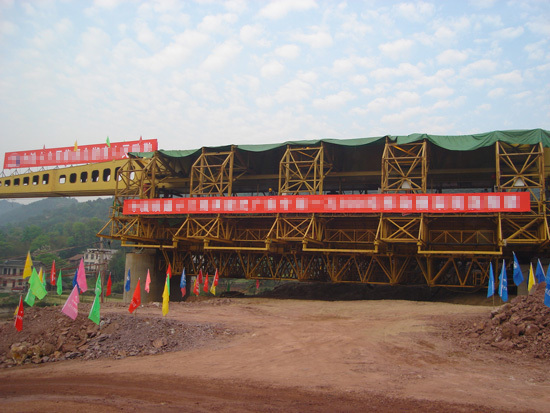 MZ Upstroke Bridge Creating Machine is the exclusive equipment for the continuous box girder field casting construction in the railway passenger transportation line project. ◆ This machine can realize the moving from one pier to next pier by itself, without other auxiliary facilities on the ground. It owns the characteristics of high mechanical degree, safety and reliability. ◆ Equip with the ceilings of rain-proof and sunscreen, the machine can operate in any time and any weather to improve the working efficiency and guarantee the construction period. ◆ While erecting the continuous girder or transferring, we just need to expand the side mould frame and base mould. There is no need to dismantle the whole machine in order to improve the transferring efficiency. ◆ We stick to the symmetrical design principles for the main girder and mould frame. So if there is the two-way construction condition, we just need to replace the position of the front guide girder, front and rear support leg, auxiliary support legs. 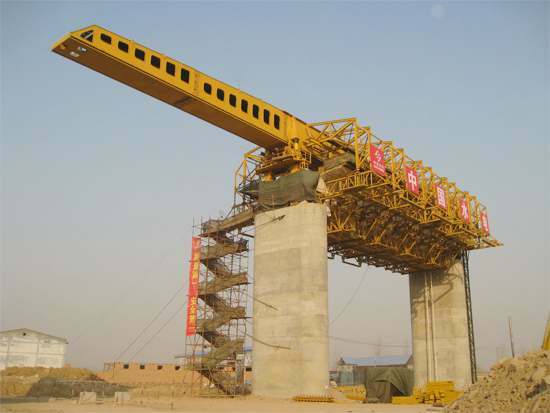 ◆ The machine can accomplish the segmental assembly erection of 32m box girder without making the adjustment on the main girder and support leg mechanism. 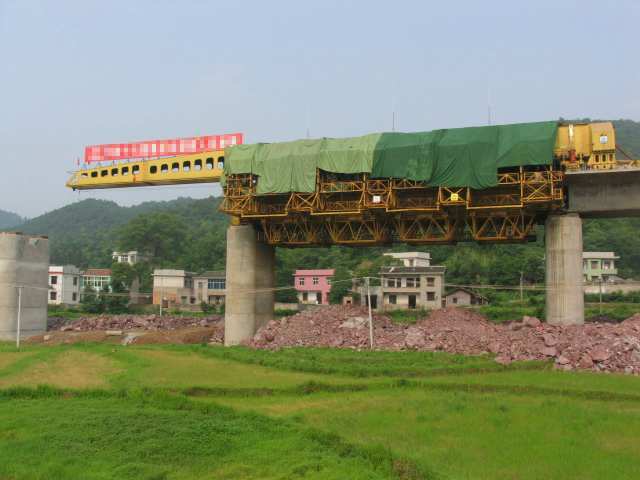 MZ UPstroke Bridge Creating Machine in passenger transportation line project is designed according to the 《Purchase and Sale Agreement》, the drawing of concrete box-girder, piers and abutment provided by customers and some national design standard in the field of machinery. 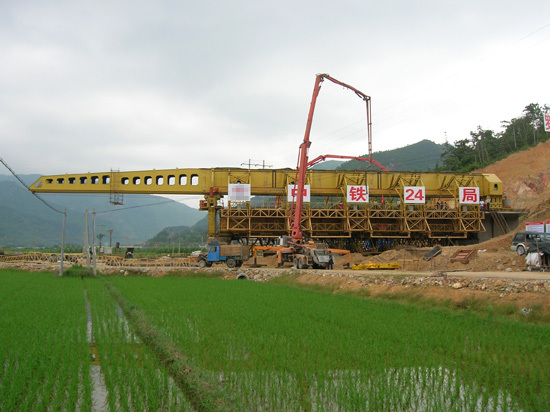 ● The machine can meet the needs of the 32m, 24m full-span box girder erection in the railway passenger double line project. ● While the machine needs to erect the continuous girder or transferring, just to expand the side mould frame and base mould. ● The machine moves with the walking hydraulic jacking system, replacing the support legs with the steel rope traction method. 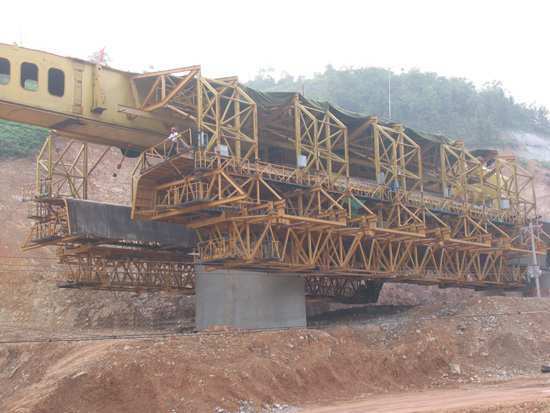 ● The single main girder structure with a rigid and flexible support leg as the supporting. ■ Firstly the workmanship department evaluates the drawing. ■ Draw up the operation instruction then make the judgment. ■ According to the drawing, workmanship technology, manufacturing skill and assembly ability to further perfect the dimensions of the machine and meet kinds of requirements. Also do the detection for the mechanical parts. ■ Prepare the clamping apparatus according to the drawing. ■ Strictly control the quality in the process of production. 5.6，According to kinds of standards, strengthen the management and control in every part and production process. ■ checking descriptive chart（controlling the geometry size and key part）. ■ The tracing data of product is made up of contract, review file, drawing , calculation book of design, specification, installation project, raw material quality certificate, product quality inspection record, welding inspection report and purchased certificate. ■ leaving factory data is made up specification, installation project, certificate and receiving report etc. Check the dimension, perpendicularity, pre-camber, deflection when the installation is done. ■ Fasten the machine bottom with pier top and beam surface embedded parts while the support legs are working. The professional personnel must check it carefully before the next procedure. ■ After finishing the poles’ installation, the professional personnel must check it carefully before casting the beam. ■ No operations in the bad weather such as: strong wind, rain, heavy fog and icy snow. ■ No operation and working if the wind force has exceeded grade 7. Take some protection measures to guarantee the machine’s stability when the wind force exceeds grade 11. ■ Equip the lighting device when the machine operates at night in the working area and passageway to guarantee the construction safety. ■ Make sure that the traveling rail is smooth without the obstacles. g, The operators must accept the professional training and achieve the operations certificates of special equipment. ■ After construction are finished everyday, the workers must check the following content: if the level of main longitudinal girder meets the requirements or not; the connection of bolts and pins are firm or not; the electrical wires are broken and extruded; hydraulic system is regular or not; the track joints are plain and smooth or not; the connection of position limiter of crane and trolley are firm or not; the rail clamping device is in the working position or not; bed timber is plain and stable and the size of gauge is right or not etc. ■ The welding lines are checked every month :：upper and down chords of main girder , web plate, vertical welding lines of legs and the welding lines of connecting frame etc. The operators should stop working when the welding lines are broken or fatigue crack. When the users find the crack by eyes, but they can’t make sure the dangerous degree, so they should use the welding inspection instrument to test and then adopt reasonable steps to deal with. ■ About the painting of structure which should be painted again every two years. The users should clean the primary surface by steel brush and pay attention to the welding lines before the structure are painted.